Don’t miss the BEST SHOW Orlando has to offer. 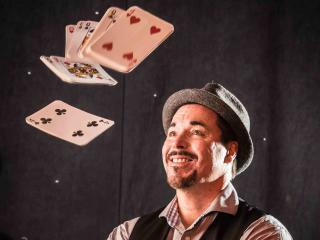 This hilarious show combines high-energy comedy improvisation, spectacular magic and lots of audience participation to thoroughly entertain audiences of all ages. Minds will be read, predictions will come true, and audience members' personal items will vanish and re-appear. The crowds don’t just watch the Outta Control Dinner Show, they become part of it! Visitors to the show receive table side service with unlimited fresh hand-tossed cheese and pepperoni pizza, salad, and unlimited beer, wine, soda and dessert. The Outta Control Magic Comedy Dinner Show is located inside WonderWorks at the heart of International Drive. 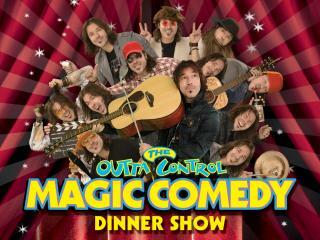 The The Outta Control Magic Comedy Dinner Show lasts around 90 minutes. It is recommended you arrive around 30 minutes before the show start time. Why not upgrade your Outta Control Magic Comedy Dinner Show to include admission to Wonderworks as well? WonderWorks is an amusement park for the mind and features over 100 interactive exhibits for visitors of all ages to experience. Here you can participate in some of the most imaginative displays and exhibits found in any facility in the United States starting with the inversion tunnel to be turned upside-down!